BLOODHOUND SSC, the British engineering showcase that aims to break the world land speed record by achieving the supersonic speed of 1,000mph, is being brought back to the borough as the headline attraction at this year's Get up to Speed with Engineering and Manufacturing (GUTS) event. Moving to Rotherham last year, GUTS is the premier event in the region aimed at inspiring the next generation of manufacturers and engineers. Bringing together employers and employment opportunities together with school children, students, parents and educators, it broke all records in 2015 with over 1,850 visitors, exhibitors and attractions. This year's event is back at the Magna Science Adventure Centre in Rotherham on Wednesday April 20. Attractions this year include F1 and motorcycle simulators, Virtual Reality Welding, University Formula Racing Teams, wheel change challenge, 2016 British Touring Car Championship vehicle and more to be announced. 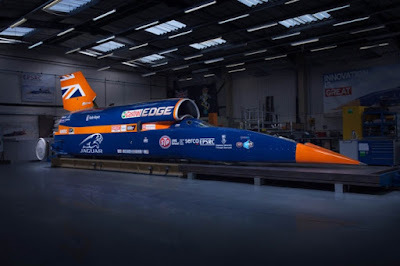 The BLOODHOUND Supersonic Car (SSC) project also aims to inspire future generations to take up careers in science, technology, engineering and mathematics (STEM) by showcasing these subjects in the most exciting way possible. A four wheeled, 7.5 tonne, 135,000 bhp jet and rocket powered car, BLOODHOUND has a few links to Rotherham - engineers at the University of Sheffield Advanced Manufacturing Research Centre (AMRC) with Boeing worked on the front suspension sub-assembly and tested a new alloy, developed for aerospace applications and contacted AMRC partner Maher, that will be used in the car's rocket pump. Newburgh, the Rotherham-based high-tech precision engineering sub-contractor is a project sponsor and has completed Auxiliary Power Unit (APU) gearbox casings for use in the car. The car played an inspiring role in last year's children's festival in Rotherham and has also been showcased on the Advanced Manufacturing Park. John Barber, chairman of the Organising Committee and co-founder of the work-wise Foundation, said: "In addition to the Bloodhound SSC and Bloodhound guest speaker other attractions include Rolls Royce Aircraft engines, a whole range of motor vehicles from alternative powered vehicles (Electric BMWi8, Tesla and ITM Power hydrogen powered vehicles), to Rally and Formula Racing cars (some built by students), a range of hands on simulators, virtual reality experiences, including welding, giant digital Scalextric track (10 X 10 metres), mind controlled vehicles and the fasted blind driver in the world. "In addition over 60 companies and training organisations/colleges/ universities will be present with their apprentices and graduates to give a real feel to jobs and careers in the industry. Oh and of course we have a Dalek and free Our Cow Molly Ice Cream!" Now in its sixth year, this annual event is on target to outstrip its previous highest attendance from last year. With over 1,500 bookings so far, the event is on track to attract over 2,000 people during the day. The Institution of Mechanical Engineers (IMechE) is sponsoring the event. Peter Ingham, regional chairman, IMechE Yorkshire Region, said: "A principal objective of the IMechE is to promote engineering as an exciting and rewarding career for young people and help to alleviate the predicted shortfall in skilled engineers in the near future. Therefore, the Institution is pleased once again to support this unique Get Up To Speed event which brings engineering companies together with young people to raise awareness of the wide variety of engineering career opportunities in the region"
A business networking event will be held at 5pm.